Given the largely rural and agricultural character of Irish society throughout its history, your Irish ancestors and extended families may well have left their mark in various different land records, many of which survive for the last 300 years or so. Unlike people, land generally behaved itself by staying in the same place and, of course, had an intrinsic value. This meant that it was the ideal commodity on which to levy tithes and taxes, pass out of the family along with a bride to guarantee her future as a potential widow, lease or buy to further the family fortunes. Land holding was also linked to voting rights. Sadly, it was also the source of woes when tumbling rents after the Great Hunger forced many an aristocratic family to dispose of the family piles in the face of not being able to meet their historical financial commitments. All of these events have generated records associated with tracts of land through which you can trace the fortunes of your family. However, how should you navigate the different record sets logically? ​Depending upon when you first encounter the relative you are interested in, there may be the potential to work both backwards and forwards from that date to see how their land holdings were passed down or out of the family. 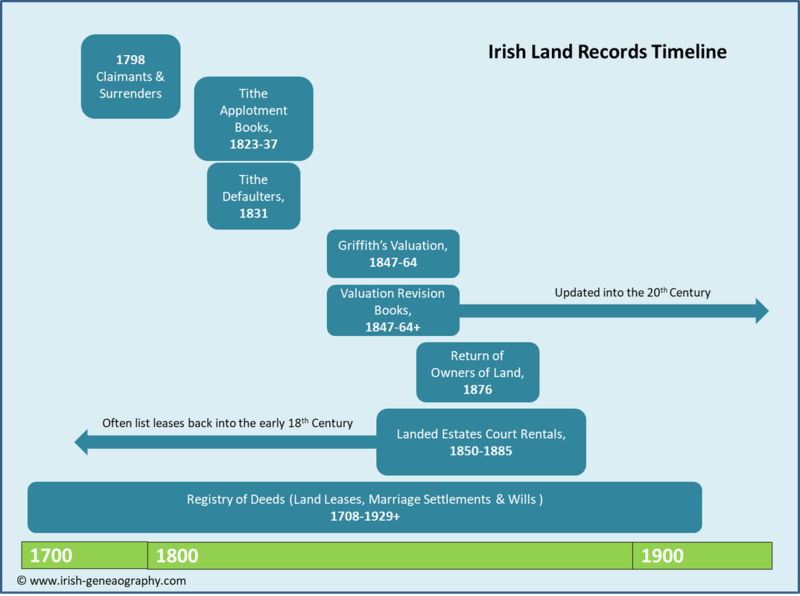 The following picture is my best effort at a representation of the land record sets I have worked with successfully and where they sit on a timeline over the last 300 years or so. Before getting too carried away, I should give you a fairly stiff health warning about drawing conclusions from the names you may find and link together in these record collections. Remember, most of these records will only really give you the name of the person, usually a man, responsible for the transaction, which is a reasonable proxy for the head of the household at the time. However, remember the prevalence of a fairly conservative pool of forenames and the fact that families of the same name were often clustered together. So, as you follow John Jones forward from the 1798 Claimants, is it his similarly named son, nephew, grandson or cousin that you encounter in later records? John Grenham suggests that you might find the name of father in brackets after some names in Griffith's Valuation as valuers attempted to distinguish between similarly named men, but I have yet to come across this myself. So, my advice is to study the dates associated with any records carefully and try to work out the likely generations that might be referenced. It is always best to try to corroborate this evidence with what you think you know from other sources. For example, you may find a marriage settlement in the Registry of Deeds that leads you to a corresponding parish record or an index entry for a marriage licence bond, or a change of land holding recorded in a Valuation Revision book may lead you to a civil registration of a death.